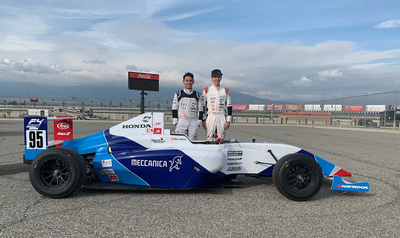 February 8, 2019 - Making a splash, literally, in their first ever Formula 4 event, Doran Motorsports Group claimed one win and three podium results in their debut weekend. Testing for the second half of 2018 and making the jump to wheel-to-wheel competition this past weekend at the Auto Club Speedway in Fontana, California, Alan Tang and Marco Kacic proved to be the pair of drivers to beat in the rain soaked weekend. "Race one of the weekend was completed in extremely difficult conditions as heavy rain arrived before and continued throughout the race," explained Francois Doran, Owner of Doran Motorsports Group. "In the end, we were able to take two steps on the podium. A great start to our 2019 season." A different day but the same wet weather conditions presented DMG on Sunday as rain fell throughout the night and into the morning. With a short warm-up very early in the morning and race two on the weekend in the middle of the afternoon, conditions would improve, but drivers remained on the wet weather Hankook tires. Kacic began his quest for back-to-back wins from the second position while Tang started race two from P3. Taking the lead early and stretching a gap on the rest of the field, Kacic looked poised to stand atop the podium yet again but an electrical issue with five laps remaining crippled his car to only second gear and forced him to retire. Tang would be a benefactor of Kacic's retirement and advance forward one position and solidify his second podium result of the weekend, crossing the stripe in the second position. For additional information on press releases or other media services offered by Race Tech Development, please contact Mike Maurini via e-mail at Info@RaceTechDevelopment.com or 317.270.8723. Race Tech Development can also be found on Twitter at @RaceTechDvlp as well as Facebook at their Race Tech Development Fan Page.